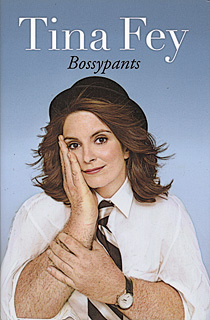 I have finally entered the 21st century and downloaded my first audiobook from Audible: Bossypants by Tina Fey. I was resisting audiobooks for a long time because it makes it possible to multi-task. And after a long day of multi-tasking, I like to turn off all the other parts of my brain by simply reading. Reading is all encompassing. Aside from waiting for/ riding the bus or “gettin’ your hair did”, you really can’t do much of anything else at the same time. Audiobooks, however, allow you listen hands-free. Many of my friends confess to driving while listening to audiobooks. But all bets were off when I discovered that Tina Fey reads her own book in the audiobook! Just looking at Tina Fey makes me want to laugh. Maybe that’s why she’s so self deprecating in her book. Parts of this book is highly relatable, laugh-out-loud humour. I listened her on my IPhone while on the bus. Laughing out loud to yourself on public transit is generally regarded as crazy. But Tina Fey makes you feel okay about that. My favourite parts were about her days in “Summer Showtime” otherwise known as summer camp with musicals. I went to a performing arts high school so this was highly relatable (hissy-fits by prima donnas, dating the gay guy, etc). I feel she drones on too long about all the other SNL writers. I really only care about her. There’s also lots of discussion around whether woman can be funny. But she doesn’t need to argue that – she’s already proved it in my books. Another favourite part was how she felt about playing Sarah Palin. She acknowledges that some hard-core, fundy Republicans will hate her forever. If you’re a fan of Tina Fey-style humour, you’ll love Bossypants as much as Fundies hate her.